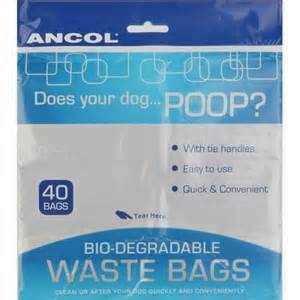 Clean up after your dog quickly and conveniently with Ancol Bio-degradable poop bags. Made from durable materials, these waste bags can be taken anywhere you and your dog go, whether it is on a walk, camping, the beach or in your own garden. Ancol Bio-degradable poop bags are designed for extreme portability and are very easy to use. Simply detach a bag from the dispenser, slip the bag over your hand like a glove, remove the waste, turn the bag inside out and dispose of responsibly. These bags come with tie handles. Pack contains 40 bags.